Your problems are interesting but it seems that HDV wasn't such a good choice for you in the first place. But in your defense none of the capture issues were well known until recently. I have been shooting with the camera since March and aside from some problems that I half-expected from adopting a very new technology, it's been a very good experience. My style is to always run the tape for 10 seconds before "action", even with DVCam. Your quick take shooting style is, unfortunately, not a happy mix with the format. As Mr Hicks suggests, a hard disk recorder would work great, I use one and the tape goes on the shelf as backup. A smart way to safeguard valuable footage. What to do with your footage now? DVHSCap and MPEGStreamclip might work perfectly. AIC capture would probably work as well and save time. I would also check the timecode setup on your camera to made sure it's not jumping frames on pauses, this always screws up Final Cut. Switch off "Stop capture on time code breaks" in FCPs preferences. If I lived in England I would be happy to pick up the "garbage" when you toss it out. William, thanks for the good tips. Nigel, I feel your pain. 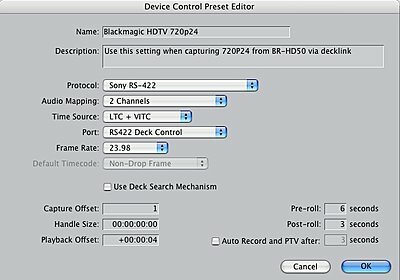 I've been researching the HDV workflow using FCP for some time now as it has become obvious that for professional work one should invest in either of the Black Magic or AJA cards. Seems like if you just bought the AJA KonaLH ($1600 US) and digitize as DVCPro HD all you headaches would be gone. Timecode comes in through RS422- no muss no fuss. You'll need more storage but that's not to much to ask for a workflow that's the same as it was for good ol' DV. As soon as the HD200 comes out I'm getting 2 of them plus the deck and the Kona LH card. Justin, thanks for the good tips. This was the solution that I figured could at least work in my studio with my desktop machines, but. The card I already had was a Decklink Extreme which according to the manufaturer doesn't support 720 30P. So I invested in a KonaLHe card. Just got it in and the RS422 is completely screwed up with my BR-HD50. The control constantly flips between saying "VTR OK" and "VTR Local". By constantly, I mean every 2-3 seconds. After a few of these then it will bring up the "New tape has been inserted..." message. It cannot digitize anything! My problem now is who is going to help me? The Kona RS422 works fine on by Beta deck (Sony UVW-1800) and on my DVCAM (Sony DSR-40) and even on my JVC DV600. So that would tend to make me think that the problem is in the BR-HD50 deck. BUT that deck works fine with by Decklink card's RS422. There's no way to trouble shoot this, and I'm sure each company will say it's the others problem. To top off my troubles with all my JVC HD stuff, if I try to turn on the time code display to make a window dub for my clients, the deck displays not only the TC, but about 20 random numbers across the middle of the screen, plus it displays the status of the "repeat" function. The only thing turned on in the displa menu is TC, as these others (whatever they may be) aren't even an option. I'm a 15 year loyal JVC fan, but I may be done. If your deck is updated, and you still have trouble with the Kona Card, perhaps you could get together by phone with Justin to compare settings on the Mac and the deck, since he's got that combination working. If you still have trouble with the window dub mode, then perhaps it needs to go in for a service check. "Won't AIC drop quality over native HDV?" I'm addressing it in this thread because it might help you make a decision on a workflow that could save you endless hours in editing your current project. "Besides, I wouldn't consider HDV to be the "best" for any post workflow, but it works well for aquisition." "If you want to edit for 35mm blowup, use the same workflow above transcoding to AIC codec. The AIC codec is compressed (not as much as HDV) but considered "lossless" because it doesn't seem to make the image any worse than it was before." "For most purposes, the layman is not going to see the difference between AIC or uncompressed, but once in uncompressed there is no generation loss at all." I know there's been a recommendation to work in DVCPRO HD and I did work with that codec late last year but abandoned it for AIC because the camera is capturing a full 1280 X 720, yet DVCPRO HD will squeeze it into 960 X 720 (per my understanding). AIC will keep it at the full 1280 X 720. The only posts I've ever seen reporting problems with AIC have been from people working with interlaced footage (1080i). AIC works best with progressive footage and gives excellent results. I'm confused. I thought this was a problem with the camera that was supposedly fixed with the "A" upgrade. I thought my upgrade was just botched. 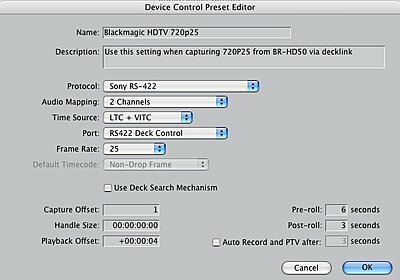 Does this mean ALL HD-100's cannot capture a full tape in FCP with start and stops straight through without dropping large amounts of footage? I shoot stuff that is impossible not to start and stop constantly. Is this type of shooting not possible with the HD-100? If so, how can I get my money back? How are other people dealing with such a MAJOR malfunction? This has been driving me nuts for a year now. I wish I knew it was just a lack of functionality from the beginning. No wonder my JVC rep will never call me back! This is not a major malfunction, and it is doubtful you will ever be able to capture a HDV tape with start/stop breaks without losing something. If you understand how tapes, TC, preroll sync, control track and Mpeg2 TS work, then this shouldn't come as a surprise. Let's compare to a DV deck. Each frame is independent of all other frames, so when you hit REC on DV the record head records a new frame wherever it happens to be sitting on the tape. You would also have to record TC in REGEN mode in order to capture this tape without breaking and recueing the clips. A DV tape still needs preroll to capture properly, but the structure of all I frames allows capture over start/stop breaks. Now, looking at HDV, we can meet the TC criteria by shooting with TC in REGEN mode, but no matter what we do, a new GOP structure will be created each time we start recording. I've heard that Sony somehow managed to create continuous unbroken GOP structures over start-stop breaks, but I haven't confirmed it. I don't believe the JVC cameras look at what is already on the tape and attempt to start a new GOP pattern at the next logical I frame. It seems they start recording wherever the tape sits. This means that we need enough preroll at each start/stop break to get the tape to speed, have the camera identify the mode and frame rate, and start reading the GOP structure. This typically takes a few seconds. I doubt any firmware update will be able to remedy this issue. However, if you do shoot with REGEN TC you should be able to preroll into the previous shot. The easy solution is to use the professional method and just shoot preroll. If you can't afford the time to shoot preroll, then explore the DR-HD100 with the 10 second cache function, or attempt cloning the tape. AIC capture (without TC) also works on occassion, as well as lowering the preroll time in the device control preset. I've gone back to doing it the proper way i.e. marking in/out points and doing a batch capture. This works fine, only you still lose half a second each end of the clip; probably down to GoPs though. So you just have to be disciplined and log and capture everything with timecode in/out points then do a batch capture. I hope Apple/JVC between them fix the Capture Now feature though as this is handy when you only have a few clips to bring in and you know they are all good. And that pretty well sums it up. The best editors, assistant editors and post-supervisors are disciplined. It is much easier to flag problems that way. You have a tape full of clips without enough preroll and you want capture them all without losing anything. You are experiencing preroll gaps on HDV capture with "capture now"
You had some dropouts on a few tapes and need to reshoot. JVC doesn't talk with Apple and "lets the public be the beta testers." First off, I'm not on this board to defend JVC, I primarily only help people with a piece of technology I happen to have alot of experience with. However, it seems like you wouldn't have said some of things you have said before you tasted XDCAMHD, and it really is unfair to JVC. Technology moves fast and it often seems Sony gets preferential treatment from Apple when new products are released. XDCAM HD is a brilliant system (we even lost our own Nate Weaver to XDCAM HD) but you can't buy one with a lens for $6000, so there isn't much point in comparing it to the HD100. As for your comment on JVC and software companies, I know that Apple was working with JVC on this for a long long time. I have no idea why it took so long, and I'd bet JVC doesn't either. Apple does things at their own pace and it just so happened that we had to wait until September 2006 for ProHD support. It is too bad, but you can't blame JVC for Apple's development pace. They obviously intended to include support for everyone in the same update, and now JVC needs to catch up to some compatibility issues they probably weren't aware of back when they conducted the 'A' updates. What we know so far is that none of the cameras are fully compatible in HDV 720P24/720P25 mode with FCP 5.1.2. A firmware update will be required - but we have no idea when JVC will release it or how they will manage it. Using "Capture Now" has always caused problems with HDV. It is pointless to compare the "ease" of your old workflow with DV or DVCAM because the two formats are very very different. Apple and Oranges. You said yourself that everything worked fine when you logged your clips first. I have an editorial background and that's just how I've always done things. This is probably why I haven't encountered the same issues. The only problems I've encountered capturing native HDV in FCP 5.1.2 is that the TC timebase for 720P24 is assigned at 30fps instead of 24fps - regardless of the device preset. The simple fix is to set the TC to 24fps after the clips have captured, so no big deal, just a little inconvenience. I doubt you are having this problem with 720P25. So the bottom line for Native HDV capture from the HD100/101 is that log & capture works fine, but those attempting quick and easy "Capture Now" workflows are experiencing issues with dropped frames. The simple solution is don't use "Capture Now." Now onto the BR-HD50 deck. 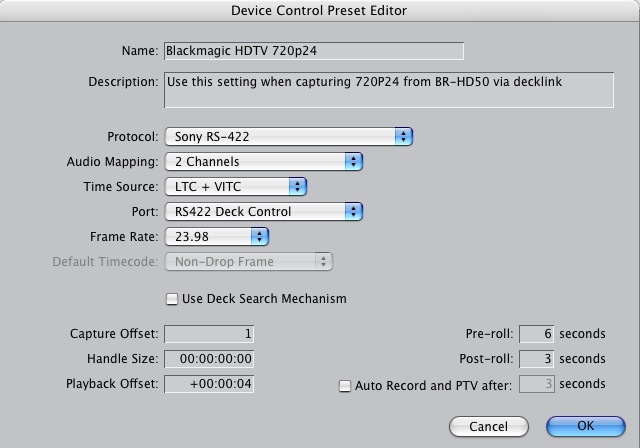 What we know is that the deck requires a firmware update for FCP 5.1.2 HDV native capture compatibility. We don't know exactly what this firmware update fixes, but it seems to work with log & capture. I can't comment much more on the deck TC because I haven't finished testing it in all circumstances. As for the deck and Decklink compatibility, you should have absolutely no problems if you set the deck, your deck control preset, and genlock properly. I have successfully used the deck with decklink on a feature film - with both 720P24 and 720P25 sources. The decklink defaults to work with BetaSP decks and similar, but the protocol RS-422 default of the BR-HD50 doesn't work the same. 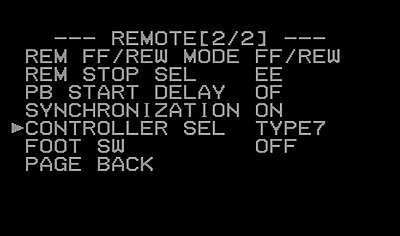 You need to set it to TYPE 7 for better RS-422 communication. 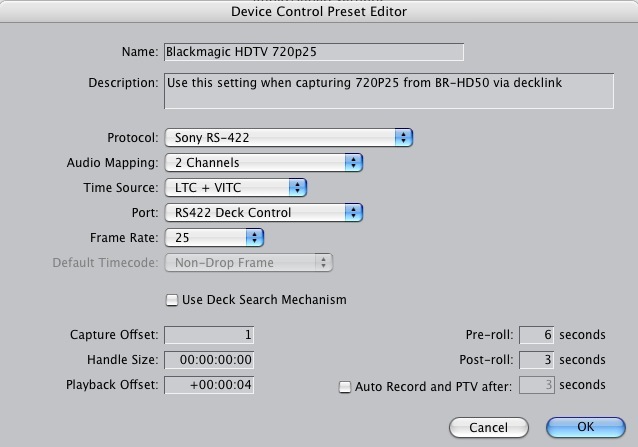 You also may need to create a custom deck control preset in FCP for 25fps TC from LTC/VITC. This worked for me and had no issues capturing with correct timecode. I recommend using uncompressed 8-bit. Stay away from DVCPROHD. Of course, you'll need a RAID array to use the decklink properly. Also, download the latest driver so that you can get the 720P25 capability. If you own a Decklink, it is the best way to work with any format. Just make sure you loop out your genlock when using the BR-HD50. The deck doesn't have a pro sync in, so instead set your output to black and use a T BNC tap to connect the genlock in to Y out of the Decklink. It looks funny but it works. I am now going through the final stages of reconform, D.I., and output to HDCAM. So far, no problems. I will post a final report at the end of November. It is important for me to point out though that I extensively tested my workflow BEFORE even shooting the project. Of course this was months ago before 720P24 HDV native capture and that's why I went with analog burn-in TC capture for the offline. I recommend that anyone new to HDV planning to shoot and edit a project themselves thoroughly research and test the workflow. The worst thing is to jump into to something with a deadline, and not understand what the technology can and can't do. I'm going to merge this thread with your original thread on the same topic. I'll also be removing any "flame" posts from the thread in accordance with dvinfo's code of conduct. Make sure you have the 1.06 firmware in your HD50. We've also suffered through the last 14 months of upgrades to the camera, deck and AJA. Believe me, version 1.02 had some MAJOR probs with serial control. There is also a bug in Kona that will corrupt the audio output when switching between formats in the BRHD50... AND LHe sometimes refuses to capture the downconverted 480i output of the BRHD50. Something tells me there are some strange timing inconsistencies in the video. Since we can't genlock the deck in our studios, there's no way to test that theory. But as you say, all the other decks work fine. Somethings not quite right with the serial control. Words of advice. Set the decks options to remain threaded when stopped or paused....increase the unthread timer. Set all preroll times to 7 secs in your editing software to give your shots a good runup to capture. Wow! Tim very good information I am going to print this one out for myself. Again you are a major attribute to this board. Not having attempted to capture HDV on the HD100 as of yet, is it possible to point me in the right direction with regard to 'log and capture'? It may turn out that I experience no issues with the workflows suggested (even native 25p editing via FCP) but it would be very beneficial to understand the correct way to edit i.e. log and capture. Apologies if this is basic knowledge but I'm only really getting to grips with video production (coming from audio background really). I second that! Tim, your contributions and wealth of real-work knowledge are a valuable asset to us all. I did do the update. Was hoping beyond hope that it would fix my problems. but no such luck. I will contact you off-list about my info. I do appreciate your help on this list. Just make sure you loop out your genlock when using the BR-HD50. The deck doesn't have a pro sync in, so instead set your output to black and use a T BNC tap to connect the genlock in to Y out of the Decklink. It looks funny but it works. Thanks for your time on this Tim. Not quite getting how you setting up your Genlock. Are you saying that the signal from my BB generator should be split, with one end going to the Genlock in, and the other to the Y out of the Decklink? I've heard that Sony somehow managed to create continuous unbroken GOP structures over start-stop breaks, but I haven't confirmed it. Somebody on another forum pointed this out yesterday. Said they have never had this issue with the Sony Cameras. Tim what issues does fcp 5.1.2 have with the HD100? This is not a major malfunction, and it is doubtful you will ever be able to capture a HDV tape with start/stop breaks without losing something. This typically takes a few seconds. The easy solution is to use the professional method and just shoot preroll. I would have to disagree that not being able to capture the first few seconds of a clip is not a major malfunction. Perhaps malfunction is not the right word, but calling it anything other than a serious lack in performance capability would be incorrect. If the camera can not do this, as every other camera I've ever worked with or heard of can, than this is a red flag that needs to be noted somewhere,i.e. "unless you are using a Kona card, the first 2-3 seconds of your footage will be unusable in the HDV mode." Rolling extra pre-roll in a controlled environment may be the "professional" way to do things, but in a ENG type of environment it can't always be done. I am shooting stuff that you have to react to the situation at hand. You cannot ask people to wait for your pre-roll. It also requires 80-100 shots per 60 minutes of tape which I may divide into 200 seperate clips. Since the advent of cheap drives I've been able to do this once the tape is digitized, which speeds up the process by over 100%. This is not using "Capture Now", I am setting an in point at the begining of the tape, and an out point at the end. I now understand that perhaps the only way to use this camera in such a setting is to buy the DR-HD100 HDD recorder. It just doesn't seem to me that you should have to do this for a very common shooting style. Just to reinforce my complaints with the ProHD equipment. Up until recently I owned two Sony Z1 camcorders and shot a number of projects on them. Sold them as I now prefer Progressive for certain things. The Z1s performed flawlessly from an editing point of view with Final Cut Pro. Both capture now and the batch capture methods worked to perfection. Scene breaks were detected and I never lost a single frame. Using log/capture method the clips that came in were accurate to the exact frame I'd marked in timecode. So it is not a HDV thing as all Sony cams I've used in 1080i have been perfect with no such hitch. I've shot with loads of different formats over the years and edited mainly on FCP (since version 1.2, Media Studio Pro and Premiere before that) and I've simply never encountered the trouble I've had with JVC. I don't have anything against JVC equipment, after all I bought a load of it. But by my experience it is just too much trouble and just too twitchy. Hopefully in 6 to 10 months Apple and JVC will have sorted it between them. But I can't wait, I'll have moved over to Sony by then. Somebody else mentioned that Apple give Sony more attention, I think they are right. Sony and Apple do talk a lot, I've even seen Sony CEO on stage with Steve Jobs during keynotes. No doubt they are in bed together and have a good relationship. Boy, I'm looking forward to this! And thanks (as always) for the great post, Tim.